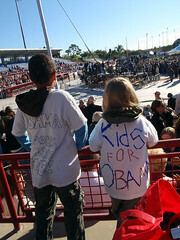 the kid on the left has a shirt that reads "Obama looks like me"
Oct. 30, 2008 I got to Ed Smith Stadium for the rally at 7 AM---quite cold for FLA...50 degrees...Met a lot of great people in line..(Susan and some fun highschoolers)...the line was huge but we weren't too far back. Once we got thru security (airport type metal detectors- and guys with sweepers who also checked your bags)-Susan and I went for a middle seat. They were trying to get us to go to the end but I wouldn't do it as I didn't wait there in line for a crummy seat! I found a middle area that an usher had vacated and we got a good spot directly across from the podium. Obama's plane with the logo flew by en route to the airport...meanwhile local politicians spoke. Finally when Obama came in he sauntered across the grass waving and smiling and eventually shaking some supporters hands. His speech was great and rousing. To the next president of the USA!